This continuing education module follows the Department of Transportation's EMT-Basic Curriculum and is meant to enhance and solidify the EMT's understanding of prehospital airway management. It was produced by emt-national-training.com with medical direction from Dr. Scott French. Instructions: Read through the Objectives so you will know what is expected of you. Read the article that follows and practice the psychomotor objectives and problem solving skills with the interactive simulations. Once you have completed these steps, click the "Take the Test" button at the bottom of the page. After answering the questions that are given with a 70% or better, you will be presented with a CECBEMS accredited certificate of completion that you can print out and utilize for 2 Continuing Education Units or Hours (CEU and CEH). 2-1.2 List the signs of adequate breathing. 2-1.3 List the signs of inadequate breathing. 2-1.4 Describe the steps in performing the head-tilt chin-lift. 2-1.5 Relate mechanism of injury to opening the airway. 2-1.6 Describe the steps in performing the jaw thrust. 2-1.8 Describe the techniques of suctioning. 2-1.9 Describe how to artificially ventilate a patient with a pocket mask. bag-valve-mask while using the jaw thrust. 2-1.11 List the parts of a bag-valve-mask system. bag-valve-mask for one and two rescuers. 2-1.13 Describe the signs of adequate artificial ventilation using the bag-valve-mask. 2-1.17 Describe how to measure and insert an oropharyngeal (oral) airway. 2-1.18 Describe how to measure and insert a nasopharyngeal (nasal) airway. 2-1.19 Define the components of an oxygen delivery system. 2-1.22 Identify a nasal cannula and state the flow requirements needed for its use. As it was so eloquently stated by the Department of Transportation in the EMT Basic Curriculum, the motivation for understanding airway anatomy and management is because, "A patient without an airway is a dead patient". With that in mind, let's begin the review. The respiratory system is responsible for the physical process of breathing. It can be broken down into two distinct areas; the upper airway and lower airway (fig 1). The upper airway consists of the epiglottis and all structures above including the tongue. The lower airway includes the vocal cords and all respiratory structures below. During inhalation air enters the nose and mouth and then passes through the pharynx, oropharynx, and nasopharynx. The air continues past the epiglottis, through vocal cords and larynx and then down the trachea to the carina, which then divides into the right and left bronchi. From the bronchi the air travels into the bronchioles and then into the alveoli. During inhalation the diaphragm and intercostal muscles contract which increases the size of the thoracic cavity. The diaphragm moves downward and the lower rib cage flares moving the ribs upward and outward. As exhalation begins the diaphragm relaxes moving upward and the ribs then move downward and inward causing air to flow out of the lungs in a passive process. The physiology of respiration is a complex process of gas exchange at the cellular level (CO2 and O2). When air loaded with oxygen reaches the alveoli, cellular respiration occurs. Oxygen inhaled into the lungs is moved into the alveoli through diffusion at the capillary level. This oxygen diffuses from areas of higher concentration to areas of lower concentration across the cell wall. This diffusion within the alveoli moves oxygen into the capillaries then arterioles and arteries to provide O2 to the rest of the body . The same diffusion process occurs with the waste product carbon dioxide from the venous system. Veins pass CO2 into the venules and then capillaries where it moves into the alveoli and finally the lungs where it is expelled during exhalation. To determine if a patient (pt.) is breathing adequately you must assess the rate, rhythm, quality, and depth of the respirations. It is important to assess each of these areas to ensure that a patient is receiving enough oxygen to prevent respiratory arrest or other respiratory related complications. Clinical pearl: Does the patient appear in distress or seem to be laboring to breathe or are the breaths shallow? As you perform the assessment of a patient's airway, you must assess the rate at which they are breathing, or how many breaths the patient is taking each minute. According to the DOT EMT-Basic Curriculum the normal respiratory rate for an adult is 12-20/minute, a child is 15-30/minute, and an infant should breath approximately 25-50/minute. Remember that you will see variations of these respiration rates from one text book to another. Note also that a patient's respirations may be slightly outside of these normal rates simply due to the stress of the situation. The rate will often return to normal after a short period of time. Clinical pearl: Try matching the patient's respiratory rate with your own, does the rate seem excessive or inadequate? Determining rhythm of respirations is also important when assessing the adequacy of a patient's breathing. The rhythm may be regular or irregular. A regular respiratory rhythm is the same volume of air going into the lungs as coming out. You may find that irregular rhythms present as short breaths then long breaths then short breaths again and or periods of apnea. Regular Rhythm. The rhythm of respirations is also equally as important. A regular respiratory pattern consists of equal chest rise and fall and a regular cycle of inhalation and exhalation. Any deviation of this would be considered inadequate breathing. Effective respirations are determined by breath sounds, adequate chest expansion, and minimum effort of breathing. Breath sounds that are bilaterally equal and full are determined to be adequate. When the chest rises and falls appropriately and equally, and there is no accessory muscle use (neck muscles or abdomen) during inhalation and exhalation, this is also adequate. This shows that there is minimum effort to breathe. Note that it may be normal for infants and children to use their abdominal muscles more than adults. Therefore, you should not be alarmed if you find this during your assessment. Depth refers to tidal volume or the amount of air that the patient is breathing. You will not likely be able to determine the exact tidal volume of each respiration, but if there is visible chest rise a sufficient amount of air is being inhaled and exhaled (Rate must be within normal limits). Current AHA guidelines have the EMT looking for adequate chest rise rather than a particular tidal volume. Research shows that tidal volume is nearly impossible to estimate in a prehospital setting unless the chest is fully exposed. Good Rate, Rhythm, and Depth are all necessary for adequate respirations. All must be within normal limits to prevent hypoxia, or possible respiratory arrest. If any of these components are abnormal it should be considered inadequate respirations. Inadequate breathing can be caused by several factors including including obstructions, inadequate expansion of the lungs, inadequate rate, or an airway filled with fluid. Trauma, foreign bodies including food, swollen tongue or epiglottis are are examples of inadequate breathing due to obstructions. Clinical pearl: Not all obstructions are caused by trauma, infectious diseases such as epiglottis, tumor masses, and upper airway allergic reactions are very common. Inadequate expansion of the lungs and inadequate rate are caused by neurologic factors including massive brain injuries, or injuries and diseases of the nerves to the diaphragm and intercostal nerves in the ribs. Airways filled with fluid are caused by blood from trauma, water from near drowning, toxic gas exposure, upper airway burns. Poor respiratory function directly affects the patient's ability to exchange and distribute oxygen to the body's tissues. If not corrected, inadequate breathing can cause death, secondary to poor perfusion and cellular death. Just as when determining adequate respirations you must appreciate the rate, rhythm and depth in order to determine if it is inadequate. Bradypnea. The rate at which a patient is breathing has a direct relationship with their perfusion status. A patient that is said to be ventilating below 12 respirations per minute is considered to be hypoventilating or bradypneic. Tachypnea. Conversely, a patient that is breathing too fast is considered to be hyperventilating or tachypneic. Cheyne-Stokes respirations are an irregular respiratory pattern characterized by breaths increasing in rate and depth followed by a decrease in rate and depth and then a period of apnea. Cheyne-Stokes respirations are commonly seen in patients that have head injuries or may be having a stroke. Biots respirations or Cluster Breathing are an abnormal breathing pattern consisting of rapid, shallow breaths followed by periods of apnea. Biots is seen with trauma to the medulla oblongata as well as strokes that affect the same region. Patients with serious head trauma may exhibit these irregular, ineffective respirations. Biots respirations are often confused with Ataxic Respirations. They are similar, but technically, Biots is clusters of similar sized breaths where Ataxic respirations are completely irregular in both rate and rhythm. Kussmaul respirations are marked by a deep, rapid breathing rate that is a corrective mechanism against conditions such as diabetic ketoacidosis or CNS problem. Typically this is the body’s way of expelling excess CO2 during metabolic acidosis. Clinical pearl: Biots, Kussmaul, Cheyne-Stokes, and ataxic respirations are all signs that there is a significant disorder of the central nervous system, no matter what the cause, including diabetic ketoacidosis. Apneustic respirations are exhibited when there is damage to the upper part of the pons. This respiratory pattern is characterized by prolonged inspiration unrelieved by expiration attempts. Ataxic Respirations are an irregular breathing pattern intermixed with irregular periods of apnea. As this pattern continues to deteriorate it becomes agonal respirations and finally apnea. Ataxic breathing is usually caused by trauma or stroke involving the Medulla Oblongata. The quality of respirations must also be assessed when determining inadequate breathing. Quality refers to lung sounds as well as chest wall expansion. Often times it is difficult to determine either, due to the patient’s size or external noise and distractions. It can be particularly difficult to assess lung sounds when “normal” has not been identified. Because of this, it is highly recommended that lung sounds are obtained in an environment that has minimal noise. A moving ambulance is not the place to get reliable lung sounds. Below are several examples of different abnormal breath sounds. Knowing the difference between lung sounds can help you better understand what the physiology of the respiratory pathology is. Wheezing A whistling sound caused by a narrowing of the airways by edema, foreign bodies, or bronchoconstriction. Rhonchi Rattling sounds that are heard from the larger airways, which are caused by an excessive amount of mucus or other material. Crackles Crackling noise associated with fluid accumulating in the smaller airways. This term is also used synonymously with Rales. Pleural Friction Rub Occurs when the pleura become inflamed and a sound is produced that sounds like dried pieces of leather rubbing together. Abnormal breath sounds can also be characterized as being diminished or absent. As stated before, knowing what is normal is very pertinent. When assessing lung sounds, your patient’s history can guide you in determining what you should be hearing. For instance, if a patient has had a left lung lobectomy you would not be expecting to hear anything on the left side. Without the history you may be inclined to draw another conclusion. Inadequate breathing can also be seen with unequal chest wall expansion. While assessing your patient's breathing it is vital that you not only visually inspect, but also palpate the thoracic region to determine the adequacy of expansion. This more detailed examination along with auscultated breath sounds will help the EMT to determine adequate vs. inadequate breathing. Example: You are assessing a patient who has just been involved in a motor vehicle collision. Upon visually inspecting the patient's chest you note that there is unequal movement (paradoxical motion) of the thoracic region. This visual finding helps you gain further insight into the patient's true respiratory status and will help you better determine if the patient is breathing adequately. A patient’s skin color, temperature, and condition are affected by the respiratory pattern of a patient. When an individual is breathing inadequately the skin may be cool, clammy, and or cyanotic. As the patient becomes more hypoxic because of inadequate breathing, there is an increased extraction of oxygen from the red blood cells. This in turn results in poor perfusion of the tissues and is evident with peripheral cyanosis. In extreme cases, core cyanosis can result which will also include cool and clammy skin. Assessing the skin's color, temperature, and condition is one of the easiest assessment techniques that can be used to determine perfusion and respiratory status . Children often exhibit different signs of inadequate breathing than those of an adult. A common sign of inadequate breathing in a pediatric patient is nasal flaring. When a young patient flares his/her nares upon inspiration, it is an attempt to increase the volume of air that is being taken in. Seesaw breathing may also be noted in pediatric patients and can be described as a breathing pattern where the abdomen and chest oppose each other during inspiration and expiration. The child is unconsciously trying to enhance the movement of the diaphragm and draw more air into the lungs. Both of these signs should be seen as serious and potentially life threatening for the pediatric patient. The upper airway of a child is considerably different then that of an adult beyond the obvious size difference. The mouth and nose of a child are much smaller in proportion to the size of their heads. This makes positioning of the head very important and different from adults. Many structural differences make a child's airway more susceptible to becoming obstructed. The tongue of a child is much larger and takes up more space in the pharynx and the epiglottis is generally larger and floppier then that of an adult. The trachea of a child is much narrower and less rigid then that of an adult. At the cricoid cartilage the airway constricts proportionally more than an adult's and is easily obstructed by swelling or foreign objects. These anatomical differences in children make it more appropriate to use a tongue depressor while inserting the OPA parallel to the tongue rather than curved away and then rotated upon entry as is recommend in adult patients. The already constricted nature of the pediatric airway makes it difficult if not impossible to rotate an OPA 180 degrees without injury to the pharynx. Pressing the tongue down creates more space and helps prevent the OPA from pushing the tongue posteriorly. Remember that children use more of their diaphragm for breathing because of the underdeveloped nature of their ribs and intercostal muscles. The pediatric rib cage cannot allow for much expansion during inhalation. This is often called "belly breathing"as the child's stomach can be seen rising during inhalation rather than the chest as should be seen in adults. It is quite normal as long as the rhythm, depth, quality, and rate are within range of AHA or DOT guidelines of 15-30 breaths per minute. Proper artificial ventilation is often dependent on an EMT's familiarity with using the various types of masks and ventilatory devices that are used in the prehospital setting. Clinical pearl: It is often possible to use a bag valve mask in a child and maintain an adequate airway. The difficulty comes in ensuring a proper tidal volume(no overexpansion or under expansion) and not overly forceful bagging technique which will traumatize the pliable airway Proper positioning of the patient, the EMT, and the ventilation device will make this often difficult process go more smoothly. There are several methods to help you determine if your assisted ventilations are adequate. If the patient's chest is rising and falling with each ventilation, the air is likely reaching the alveoli where cellular respiration has the opportunity to occur. If your patient's heart rate returns to within normal ranges your assisted ventilations are also likely adequate having produced a positive result by reducing hypoxia. The artificial ventilation rate must be within the ranges that are in accordance with the newest AHA Guidelines. For adults with or without a simple oral or nasal airway in place, a rate of 10 to 12 assisted breaths per minute is recommended. Children in need of artificial ventilations should be given between 12-20 breaths per minute according to recent AHA guideline changes. A new wider range of pediatric assisted ventilations was adopted in order to allow the EMT more freedom to tailor the assisted ventilations to the patient and situation. If your patient has had an advanced airway such as an ET tube or Combi used to secure the airway, the assisted ventilatory rate is reduced to 8-10 breaths per minute according to American Heart Association (AHA) guidelines. This is for adults and pediatric patients. Remember these ventilatory rates are for patients in respiratory distress only. If the patient does not have a pulse then CPR is required and you would deliver approximately 5-6 breaths per minute while allowing for approximately 100 chest compressions over that same minute. These numbers follow the current AHA ratio of 30 compressions to 2 breaths. Inadequate assisted ventilations can be deadly and are often detectable by the absence of proper chest rise and fall. If the chest is not rising, air is not likely reaching the alveoli and the body is not being properly oxygenated. Failure of chest rise can be attributed to several things, foremost is the blocked airway. When a patient is unconscious, the tongue often falls back against the pharynx blocking the trachea and inhibiting air from passing into the lungs. In fact, the tongue is the most common cause of obstruction in the pediatric population, anaphylaxis, and those adults with larger tongues, including those of African heritage. Use of a simple oral or nasal airway is useful in displacing the tongue and maintaining the open airway during assisted ventilations. If the rate at which the patient is being ventilated falls outside of acceptable ranges stated above, the assisted ventilations are considered inadequate. Too many assisted breaths can increase the chances of gastric distention and cause vomitus which will further compromise the patient's airway. Not delivering enough ventilations can result in hypoxia and eventual tissue death if the problem is not corrected. Inadequate assisted ventilations can also be the result of too large of a breath being delivered. Studies have shown that delivery of a breath that is too large can increase the pressure in the thoracic cavity. This increased thoracic pressure then puts pressure on the heart which decreases the venous return to the myocardium. Opening the airway is a simple task if it is done correctly. In a supine patient it can effectively lift the tongue from the back of the pharynx and establish that very necessary passage for air to pass from the upper airway to the lower airway. It must be performed after sizing up the scene and initial assessment or triage if it is a multiple patient incident or trauma. Opening the airway of a trauma patient will require using a different technique (when possible), then that of a patient who was witnessed to have just “stopped breathing”. In a non trauma patient you should use the head-tilt chin-lift. In a trauma patient whom you suspect has a cervical spine injury you should attempt to use the jaw thrust maneuver. If it is not immediately effective you should use the head-tilt chin lift maneuver. Upon arriving on scene of a non trauma patient that "just stopped breathing" and was witnessed, you should perform a head-tilt chin-lift to open the airway while the patient is in the supine position. You can perform this method of opening the airway as long as you do not suspect a spinal injury. 1. Assure the patient is in the supine position, and kneel beside his/her head. 2. Place the palm of one hand on the patient's forehead and apply pressure down. 3. At the same time using the fingers of your other hand hooked under the mandible, lift upward gently and tilt the head backward. To ensure you do not further block the airway, avoid pushing on the soft tissue near the bony part of the mandible. This can push the tongue posterior in the mouth which is what you are trying to prevent in the first place. Maintain contact with only the bony part of the jaw if possible. 4. While tilting the head and lifting on the chin simultaneously you should lift in a slow constant motion. Continue to hold the head in this position and determine if the patient is breathing on his or her own. An adjunct would be appropriate at this time to maintain an open airway. 1. Kneel above the supine patient's head while holding their head in an in-line neutral position. 2. Place your thumbs on the pt's. cheek bones while extending the rest of your fingers around the patient's cheeks. 3. Place your ring finger and middle finger of both hands on the angle of the mandible and lift anteriorly. This should open the pt's airway by lifting the tongue off the back of the throat without compromising spinal integrity. Does your patient need suctioning? Is the pt's. airway clear? Have they aspirated or is there a threat of aspiration? Is there saliva or food compromising the pt's. airway? These are items you must consider when you are faced with determining and securing a patent airway. You must constantly assess the airway and be ready to suction at any time. Gurgling is the first sign that an airway needs suctioning. that could otherwise be aspirated. Note that some suction units are inadequate for removing solid objects such as teeth, foreign bodies, and food. Advanced airway techniques are needed to mitigate these situations. When ventilations are performed artificially and gurgling sounds are heard, you must immediately suction the airway. Always wear proper personal protective equipment and body substance isolation garments when suctioning airways. Suctioning equipment consists of mounted and portable equipment. Mounted units are found in the hospital setting and in ambulances. Portable suctions are easy to carry units that are used to suction airways in areas such as a patient’s residence or an MVC. Portable units can be electrically/battery powered or manually powered such as hand suction units. The other type of suction device is a manual unit. The hand-powered or manual suction unit is used for emergency situations when the other types of suction devices are not available. To operate the manual suction you squeeze a handle. By squeezing the handle you create a negative pressure and pull secretions into the device. 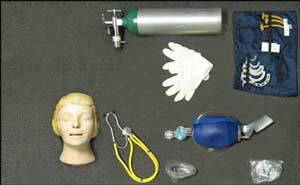 See steps to provide proper airway suctioning below. an infant or child, but you must be cautious not to touch the back of their airway. Soft or French catheters are useful for suctioning the nasopharynx or in other situations where the rigid catheter cannot be used. The French catheter should be measured so that it is inserted only as far as the base of the tongue. In advanced airway situations a French catheter can be used to suction advanced airway devices such as an endotracheal tube. You should inspect the suction device on a regular basis, before it is needed in an emergency situation. When inspecting the suction device, ensure that all tools (suction hose, catheter, and container) are present, the device turns on, and mechanical suction is present and that the battery is charged (if portable suction device). A properly functioning unit should generate approximately 300 mmHG of vacuum. 1. Attach a catheter. Be sure to use the rigid catheter for mouths and a bulb suction or French catheter for nasal passages. If you do suction the nasal passages, turn the suction down to low or medium suction. 2. Insert the catheter into the oral cavity without suction. A good landmark to begin is at the base of the tongue, working your way anterior. consult medical direction for assistance. Clinical pearl: Hold your breath while suctioning, stop suctioning prior to your own feeling of air hunger. After the call you have a mess to clean up. Most often the suction materials, except the suctioning unit, are disposable. Throw away the catheter, suction tubing, and the secretion/liquid capture device at the end of the suction tubing. Suctioning airway is a very important intervention. By protecting the airway you could prevent further complications, including death. Remember to always wear all PPE and call for more resources if you need them. Mouth to Mask - Choose the appropriate sized face mask which should include an attached, one way valve to prevent contact with oral fluids. Attach oxygen tubing to the O2 port on the mask and then to an oxygen cylinder flowing at a rate of 15 Liters per minute. Ideally you should position yourself at the top of the supine patient's head and include manual stabilization of the head and neck if trauma is suspected. Apply the mask to the patient's face placing the wider portion over the mouth and the narrower portion over the nose. Using your thumbs and forefingers apply downward pressure to the mask making an airtight seal, while at the same time using the remaining fingers to pull upward placing pressure on the mandible. With the mask in place, open the airway with the appropriate technique and deliver breaths through the one way valve with just enough volume to make the patient's chest rise. Use the proper rate for the patient's age and condition. Bag Valve Mask (BVM) - A bag valve mask is often used to artificially ventilate a patient who is breathing too slowly or not breathing at all. It is most effective when being utilized by two EMT's rather than one as maintaining an air tight seal on the mask can be very difficult with one hand. If you suspect your patient has had trauma involving the neck or back you should have an assistant hold manual C-spine while you ventilate. If you are alone you can kneel and use your knees to help stabilize the patient's head. A BVM can usually be found in 3 different sizes for infants, children and adults. It should consist of a self inflating bag with a one way valve, an oxygen inlet port and an oxygen reservoir bag for delivering high concentrations of O2. The BVM should have a non clogging valve that operates even in the presence of large pieces of vomitus. The BVM should also work with other standard airway adjuncts , ET tubes, Combitubes etc. with a 15mm/22mm fitting. The BVM is best utilized with an airway adjunct in place. After the airway is open select and apply the appropriate sized mask. First apply the apex of the mask over the nose and lower it to encompass the mouth. Create an air tight seal by positioning your thumb and index fingers in a C position over the mask. Apply downward pressure with the thumb(s) and index finger(s) while hooking the remaining fingers under the mandible and gently pulling upward toward the mask. If Oxygen has not been attached to the O2 port yet it should be done now delivering 15 Liters Per Minute through the mask. Compress the bag and look for adequate chest rise and fall with each ventilation. If chest rises and falls continue ventilating at appropriate rates stated above. If chest fails to rise adjust the mask seal or try repositioning the airway. If the chest still fails to rise check for airway obstructions and consider utilizing a different method of artificial ventilations like a pocket mask. This is the Practice NREMT Bag Valve Mask Apneic Patient Skill Station. This online skill station was designed to help you learn the exact steps necessary to pass the EMT Basic Practical Test for this skill. This test is timed. You have 45 seconds to initiate ventilations after clicking the start button. Additionally you must not take more than 20 seconds from the time you adjust the oxygen flow rate until you restart ventilations with the additional EMT. ...and a text entry box like this one. 1. Click on the appropriate equipment within the image to indicate your intent to use it. Flow Restricted, Oxygen Powered Ventilation Device (FROPVD) - Use of a FROPVD should include all BSI and airway opening maneuvers used for other artificial ventilation devices. This includes manual stabilization of the head and neck for those patients suspected of trauma. The FROPVD is manually triggered and used to deliver 100% oxygen at a rate of up to 40 liters per minute. If improperly used the FROPVD can cause lung damage and death. Clinical pearl: Diseased lung tissue is surprisingly susceptible to barotrauma, this includes asthma, COPD, and lung infections, and lung cancer Even when used properly there is a chance of causing gastric distention in the patient which will increase the chances of emesis as well. The EMT must pay constant attention to the patient and the rise and fall of the chest in order to ensure the device is being used properly and the patient is being ventilated safely and effectively. When the flow restricted, oxygen powered, ventilation device is activated, usually through depressing a button, the valve opens and delivers a continual flow of pure oxygen until the button is released or the inspiratory pressure relief valve opens. The inspiratory relief valve opens at 60 cm of water or less, venting the remaining gas or stopping the flow of oxygen. This mechanism is incorporated to lessen the chance of causing a pneumothorax in the patient or gastric distention when air is allowed to enter the esophagus. Well designed FROPVD incorporate an additional safety feature to the pressure relief valve that sounds an audible alarm alerting the EMT if the relief valve has been triggered. All FROPVD should have a manual trigger positioned so that the EMT can activate it while maintaining both hands on the mask ,holding it in position while the oxygen is being delivered. The EMT should press and hold the oxygen delivery button until the patient's chest rises adequately and then release the button. This process should be repeated every 5 seconds. If the abdomen rises rather than the chest try repositioning the head. If O2 is leaking out from under the FROPVD mask try repositioning your fingers or the mask itself. If adequate chest rise can still not be achieved, you must move to a different ventilatory adjunct like a pocket or bag valve mask. Patients who have had a laryngectomy will have a tracheal stoma which is a hole in the midline of their trachea. The skin tissue of the throat and the trachea are joined together as a permanent opening through which the patient breathes. This permanent opening is called a tracheostomy and may or may not have a tube protruding from the hole. If there is a tube, ventilating with a BVM can be done by attaching the BVM directly to the tracheostomy tube with the attached adapter (just remove the mask from the BVM). Your patient should also get high flow 02 at 15 LPM by attaching the oxygen tubing directly to the BVM. If the patient does not have a tube use an infant or child mask to create an airtight seal around the stoma. Seal the mouth and nose with one hand (if you are alone) and ventilate the patient through the stoma with the BVM in the other. Look for adequate chest rise then release the seal on the nose and mouth allowing more air to escape through the upper airway during exhalation. If your patient with a stoma or tracheostomy does not have adequate chest rise while ventilating try suctioning the stoma and mouth with a soft tipped catheter before you attempt to deliver breathes through the patient's mouth or nose. If you have to ventilate through the mouth or nose of a tracheostomy patient you may find it easier if the actual stoma in the trachea is sealed during the delivery of ventilations. Remember that unlike other patients, patients who are being ventilated via a stoma will not benefit from the head tilt chin lift maneuver nor the jaw thrust maneuver in an attempt to open the airway. The tracheostomy opening is far below the pharynx and potential occlusion by the tongue. As mentioned above, the most common issue surrounding airway management is the obstruction by the tongue of the pharynx while the patient is lying supine. Tongue obstructions can often be managed by the head-tilt chin-lift method, but once the maneuver has been released the tongue may again fall back against the pharynx occluding the airway again. The EMT Basic typically has two adjuncts at their disposal to help get the airway patent. The Oropharyngeal Airway, (OPA), Oral Airway is a plastic device that is rigid with a flange on one end to rest on the teeth. The other end is curved with either open channels on the sides or a hole down through the center for air to pass. The curved end is inserted into the oropharynx and helps displace the tongue . There are several standard sizes of OPA's to choose from that range from infant up to adult sizes. It is imperative that when selecting the appropriate sized airway that you measure from the corner of the patient’s mouth to the angle of the mandible or from the corner of the mouth to the bottom of the earlobe. Remember that this adjunct is used only on a patient that does not have an intact gag reflex. Otherwise, the patient could end up vomiting and further compromising his/her airway. Once the appropriately sized adjunct has been selected open the patient’s mouth with the thumb and fore finger used in reverse scissor motion. Insert the airway so that the curved portion is toward the hard palate. Once the adjunct is inserted, gently rotate the adjunct 180 degrees so that the curve of the airway is parallel to the patient’s tongue and that the flange rests on the patient’s teeth. While the airway is being rotated, make sure that the tongue is not being pushed posteriorly. An alternative way of inserting an oral airway is by using a tongue depressor. To use this method, press the tongue downward and with the oral airway curve parallel with the tongue, gently insert the device into the patient’s mouth until the flange rests on the teeth. This way is preferred in pediatric and infant patients. A Nasopharyngeal Airway, (NPA), Nasal Airway is an alternative airway adjunct that may be used when patient’s have an intact gag reflex. An NPA is less likely to stimulate vomiting than an oral airway and may also be used on patients who are responsive, but still need assistance in keeping the tongue from obstructing the airway. The nasal airway is a pliable tube that is inserted through the nose that when fully inserted, the tip is located in the posterior pharynx. To appropriately select the size, measure from the tip of the nose to the tip of the patient’s ear. One thing to keep in mind is the diameter of the airway in relation to the patient’s nostril. Once the appropriately sized device has been chosen, lubricate the airway with a water soluble lubricant. The airway will then be inserted into the nostril with the bevel pointed toward the septum. Gently insert the device until the flange is resting atop the patient’s nostril. If the airway does not insert fully into the nostril then attempt the same procedure in the opposite nostril. Nasopharyngeal airways are contraindicated in basal skull fractures, apneic patients, and those with severe facial trauma as they may enter the skull and exacerbate the injury to the brain. Signs to look for are Battle's sign and Raccoon eyes as they may be indicative of these types of fractures. Remember that these signs are generally late signs. A person may have a basal fracture and have no visible sign during assessment. Use of an oral airway is preferred in these cases, but as always may illicit a gag reflex. Because oxygen is stored under pressure, all measures must be taken to handle these cylinders with extreme caution. It is highly recommended that all tanks should be positioned and secured to prevent falling and inadvertent blows to the pressure regulator during transport. Pressure regulators are devices that reduce the delivery of pressure from within an oxygen cylinder to the administration device being used on a patient. Typically the pressure in a full oxygen cylinder is approximately 2,000 pounds per square inch (psi). However, this pressure has some variance depending on the ambient temperature to which it is stored. When a pressure regulator is used, the working pressure is reduced to 30 to 70psi. In most cases, cylinders that are size E or smaller have a regulator that are manually attached to it. Cylinders that are greater than a size E have a valve assembly attached to it which then has an external regulator that supplies a house supplied oxygen delivery system. In most cases dry Oxygen is not harmful when applied for a short period of time. When the need arises for a sustained period of use, it is recommended that patient’s be administered humidified Oxygen so that the mucosa does not dry out. Generally this is not needed for pre-hospital patients. Caution should be taken when operating an Oxygen cylinder due to the pressure that it is stored in. First, the protective seal must be removed. Next, quickly open then shut the valve to blow out any particles that may be present. Attach the regulator-flowmeter to the tank. Once the flowmeter is attached, attach the oxygen delivery device to the flowmeter. Now, open the flow meter to the desired setting and attach the device to the patient. Lastly, when complete, remove the device from the patient, turn off the valve and remove all the pressure from the regulator. Multiple devices are made to deliver oxygen based upon the patient’s need or condition. A thorough assessment should be performed to determine the best device suited for your patient. The following is a list of devices commonly used to deliver oxygen. Non-rebreather masks are face masks with an oxygen reservoir attached to the base of the mask. The reservoir is used to collect 100% oxygen that is supplied through the oxygen tubing. This device is the preferred method of administering oxygen to a patient in the pre-hospital setting. A non-rebreather can efficiently deliver 60% to 100% oxygen when the flow is set to 10 to 15 lpm. The oxygen reservoir should be full prior to placing the mask on a patient and the flow rate is set so that the when the patient inhales, the bag does not collapse. Patients who show signs of cyanosis, cool, clammy, short of breath require a high concentration of oxygen. There have been concerns about the dangers of administering a high concentration of oxygen to patients with a history of chronic obstructive pulmonary disease (COPD) and infants and children. This has not been shown to be valid in the pre-hospital setting. Patients with COPD or those patients who require a high concentration of oxygen, including infants and children, should be administered it through a nonrebreather. Non-rebreather masks come in different sizes for adult, children and infants and should be selected appropriately. Simple face masks are designed similarly to that of a non-rebreather, the difference being the lack of oxygen reservoir. In a patient who is breathing with in normal ranges the simple face can deliver a concentration of oxygen between 40%-60%. The flow range for these devices is 8 lpm and 12 lpm. A flow less than 8 lpm may result in retention of exhaled CO2 causing hypercarbia. Simple face masks are used for patients that are experiencing moderate hypoxia. Nasal Cannulas deliver oxygen through two cylindrical prongs that are inserted into the nares of a patient. Cannulas can provide anywhere from 24% to 44% oxygen. The flow rates for nasal cannulas are between 1-6 liters per minute (lpm) and should not be set greater than six lpm for the comfort of your patient. Doing so, drying of the mucosa and may result in epistaxis. Nasal cannulas are typically used for long term oxygen therapy but are used in the pre-hospital setting for the patient who may not tolerate a non-rebreather. Cannulas are ineffective for patients who are apneic, mouth breathing or are in respiratory distress/arrest. It is important to note that the nasal cannula is rarely the best method of delivering adequate oxygenation for patients in the pre-hospital setting. This device should only be used when the patient will not tolerate a non-rebreather mask, despite any attempts to coach the patient by the EMT. There are many special considerations to be aware of when performing any type of airway management. Although not encountered often, patients with laryngectomies (stomas), infants and children, patients with facial injuries, obstructions and patients with dental appliances all pose unique challenges in airway management. 5. Apply suction while withdrawing the catheter. During this time, the patient must be instructed to cough or exhale. Patients may also have partial laryngectomies which pose a higher degree of difficulty when artificially ventilating with a BVM or mask. If, upon artificially ventilating a stoma, air escapes from the nose or mouth, close the mouth and pinch the nostrils while ventilating the patient. As always, visualization of chest rise and fall along with your other basic indicators of oxygenation and ventilation should be observed for effectiveness. Infants and children can also pose challenges with airway management. The differences in airway anatomy and size can make them more difficult to manage. When providing any type of artificial ventilation to these patients, placing the head in a neutral position for an infant and a little past neutral for a child should allow for the appropriate axis to be met for adequate ventilation. A rolled up towel or sheet about an inch thick under the shoulders may be all that is required. Adequate axis relates to the ear canal and shoulder being inline. This will maximize the airflow into and out of the airways by providing the most direct route into the lungs without obstruction or deviation. Always avoid hyperextension of the child's head as this can create a mechanical airway obstruction of the trachea. It is also important to avoid excessive bag pressure while ventilating a pediatric or infant patient. Again, you will want to ventilate only enough to see the chest rise. Using a pop-off valve is discouraged. These valves must be disabled if the BVM that you are using comes equipped with one. Failure to do so may result in excessive bag pressure. Because of the anatomical differences and the degree of difficulty in managing a pediatric or infant airway continuously, gastric distention becomes more common. The use of an oral or nasal airway should be highly considered. By using on of these devices, the provider increases the ability to ventilate the patient. Facial injuries also create a unique problem when managing the airway of a child or infant. The blood supply to the face is extremely rich so blunt or penetrating injuries to the face frequently result in severe swelling. For this same reason, bleeding into the airway from facial injuries can be a challenge to manage. Bleeding control, constant suctioning and proper airway positioning are paramount to managing these airways. Foreign body airway obstructions (FBAO) can be a common problem in the younger pediatric and infant patients. They explore their environment with their hands and mouth thus increasing the likelihood of an obstruction. The airway management techniques for a FBAO should be followed. Several scenarios may be present to the provider. These include a partial obstruction for a patient who is conscious, a complete obstruction in the conscious patient and a complete obstruction in the unconscious patient. When a foreign body airway obstruction persists, the EMT should provide three cycles of the appropriate FBAO procedure, then transport and continue to provide the FBAO procedure en route. Dental appliances can also create a special consideration for airway management. It is advised that if a patient has dentures in place, they should be left in only if their position can be continuously monitored, as they easily become dislodged. However, dentures do run the risk of becoming dislodged in an emergency and should be taken out if this occurs. 1. U.S. Department of Transportation (USDOT). (1994). Emergency Medical Technician-Basic: National Standard Curriculum. Downloaded November 3, 2006, from http://www.nhtsa.dot.gov/people/injury/ems/pub/emtbnsc.pdf. log in to the website , and click the button at the bottom of the same article that you are presented. 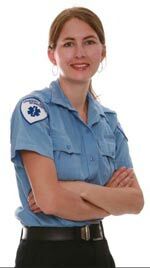 Copyright 2009 - 2019 CEU-EMT.com - EMT National Training, EMT & Fire Training Inc.